I like the Yes People. Who wouldn’t? They’ve got a fantastically daring vision, and they’re unafraid to upset the status quo in favour of creating a society that’s more just. They seem like builders. With all their zeal to engage the world as a blank slate rather than an inherited order, I think I’d like most Yes People quite a lot. It’s just too bad the size of their dream is so small. Building a new, independent state is no small feat, but it is a small, unradical and unprogressive dream. The Westphalian nation-state – really? An old-fogey fetish that fortifies and glorifies an ancient concept of ethnicity, defining itself against others, dividing itself from common cause across many nations? Why are Yes People, from Scotland to Quebec to Catalonia, so obsessed with gifting the world another thing as horrible as this? It seems funny. Yes People express a fantastic, radical positivity about what politics ought to be, but the anachronistic solution of nationalism is just so poor. Recognising that the old order is corrupt and elitist and impossibly out of touch is one thing – the prospect of carving out a unique island of self-reliant justice, though, smells like something else. The coincidence of nationalism and social democratic optimism has always seemed uncomfortable to me. Because to choose the former as a means of achieving the latter does suggest something contradictory, and a bit awful – that one people are actually inherently more just than another. That the borders once drawn up by monarchs, generals and ancient elites continue to be valid boundaries for whole ways of thinking and looking at the world. While Yes People are relentlessly progressive in some senses, they’re also basing the separatist project on the implicit assumption that those across the border aren’t capable partners in making a fairer world. We, the exclusive we, are fairer by design. If that itself sounds unfair, I’d welcome the counterargument. To me, the big positive dream has to be bigger than drawing new lines between ourselves in the naive hope that our most familiar neighbours are fairer than the rest – the big positive dream is to say that borders themselves represent the worst of the old world, and that something more interdependent, and more social, and more purely civic can be built on top of the kingdoms of centuries gone by. Let’s get a dream going that we can all rally round, regardless of race, language or geography. What are some examples? The big one that Yes People recognise is that Westminster itself is deeply, deeply flawed. I mean deeply. It’s upper house is a gaggle of unelected partisan hacks and millionaire donors. It seems to govern for the whole country on odd days and for London and the South East on even days. And, when political crises hit (like, the very Scottish referendum itself), it suddenly lurches planlessly into ad hoc distributions of powers, spraying them against the squeaky wheel in a mad, oily, last-minute panic. Let’s be honest – the Mother of All Parliaments is a letch and a dunce and it needs a good kick up the backside. So a fairer, federal, devolved, de-Westminsterised country is in order. Let’s do it! We can federalise the country into English regions, Scotland, Wales and Northern Ireland, each with regional authorities commanding meaty constitutional powers. We can decimate the Lords (not literally – we’re not monsters, after all) by cutting the upper house to a tenth of its size and ensuring all future members are elected by region – mixed-member constituencies, shall we? We can cut the Commons by half, too, since half their work will be run by the regions, and we could field out half the civil service to the regions as well. Bring authority as close to people as you can, draw it up in a written constitution, and proceed as a country that works as a proper, future-orientated democratic concert of powers – not as a chew-toy for the Bullingdon Club. That kind of reform sounds like a big, mad,impossible dream. But a dream, I think, that’s suitably big for the energies of the Yes People. Some think that the UK is just an irredeemable thing, and that carving ourselves into ethno-bits is the best approach for everyone. George Monbiot, in classic contrarian form, is one English advocate of Yes, though he too is dreaming the smaller dream. In wondering how a modern, independent Scotland might vote in a hypothetical referendum to join the UK, he says that no nation in any healthy condition would ever volunteer to cede power to a larger polity. I’m a social democratic pro-European, so I obviously think he’s missed a pretty big point. Just as I want the UK to stay together, I do want the UK to then also plunge more deeply into the European system – not because we’re a desperate country, and not because I like the EPP politics of Barroso and Juncker, but because Europe needs more social democrats. We’re obliged not to simply fold our arms, slink off and leave Brussels to it – and so I’d say the same to the Yes People. Get in. Muck about. Change things for the better, not the smaller. My biggest fear about the big dreams of the Yes People is that the thrill of nationhood is the real driver, and that disenchantment with how the UK functions is just the cloth within which to couch a more basic, brute form of face-painted nationalism. Admittedly, there’s something a bit underwhelming about committing to long-haul constitutional reform of the UK, and indeed the whole of Europe, as compared with the sheer excitement of celebrating an Independence Day for its own sake. But in a world where Toyota has more economic clout than the Czech Republic, Independence Days are increasingly expensive vanities. However unaccountable Westminster looks from here, transnational corporations are most certainly worse. Better off for people to pool our powers within a big, muscular, interdependent, multinational democracy than to cut ourselves into little bits – or it won’t just be the annoyances of a too-distant capital that will nudge at our local sensibilities, but the companies without capitals, able to bully and coerce the small states at will. United, as they say, we stand. So, Yes People, let’s go bigger than Scotland. Let’s work to change the UK and the whole of the EU, as an active, confident member of each. Driving reform, forcing fairness, equality and investment in people, and pushing for a system that people are actually happy to vote for. Anyone who thinks it can’t be done, I hate to say, isn’t really a proper Yes Person at all. The Brits have made just as big a dog’s dinner out of the F35 file as the Harperites have. Whereas Canadians are fond of the word “boondoggle” to describe the government’s hopeless mismanagement of money and priority, the term in the UK right now is “omnishambles.” Both are beautiful in their own special way. Boondoggles and omnishambles aside, the biggest difference in approaches to this file, unsurprisingly, is that Westminster have now admitted that the programme is simply not viable, and they’re now pulling a difficult u-turn. Ottawa, in contrast, hedges and hides and lies and pretends all is well, when it is blindingly obvious they have already gone much too far down this broken road. How long will it be till the F35 programme itself is wound down? And will Peter MacKay still be posing in the cockpit when they fill it with mothballs? In case Ottawa’s summer recess is leaving you with a shortage of inane, lobotomised robots parroting meaningless spin through your television, here’s a treat I think you’ll like. Britain’s Labour Leader Ed Miliband demonstrating exactly how to do media manipulation in the worst possible way. ITV’s Damon Green asks Miliband a series of questions regarding last week’s public sector strikes. The questions are different, but the answers are positively identical. Recited, insincere non-responses, memorised in advance, and bleated out regardless of the nature of the question. It’s part hilarious, and part extraordinarily depressing. Much like life, I guess. It’s caused a very welcome fuss over here in Angleterre, about the nature of plastic politics and how much dopey insincerity the public should be expected to swallow. Read Charlie Brooker’s fantastic take on the Miliband Loop, which pretty much says everything I would have said here, so I’ll save myself the typing time, and just direct you to Mr. Brooker. Also, read interviewer Damon Green reflecting on his experience of confronting an unimaginative robot with zero media engagement skills, save for the unashamed willingness to try on a speak-and-spell soundbite mantra in place of a conversation. From Canada’s blushing outrage at Brigette DePape’s stop sign, to the House of Commons’ brand-new heckle-bans, it seems there’s little more important these days than the skin of respectful politesse. Any concern, though, for the health of the deeper corpus? The British House of Commons, for example, is not a place characterised by decorum, but most would say it works well. It is indeed a raucous chamber of loud hoots and heckles, brazen browbeatings, laddish one-liners, and disparaging quips. Teasing “yeas!” and “whoas!” are bellowed from the backbenches, in support or in attack, of leaders’ proclamations. Each session of Prime Minister’s Questions truly feels like trial by drunken fraternity, and both Labour Leader Ed Miliband and PM David Cameron dish out, and receive, the kinds of bruising blows that would absolutely liquify Stephen Harper et al. Watch yesterday’s Prime Minister’s Questions for a sample. But what’s telling, and it came up in yesterday’s session, is that, in both the Canadian and British Parliaments, one thing you cannot do is accuse another member of lying. Because that’s impolite. Cameron made the mistake of accusing Miliband of “misleading the House,” which led the Speaker to demand a retraction. Cameron said median (hospital) waiting times had gone down and claimed Miliband had misled the house about the issue two weeks ago, prompting an intervention from the Commons Speaker, John Bercow, who urged him to withdraw the remark in line with protocol. Such protocol is one component of a broad effort to maintain a some semblance of dignified decorum in the House, and fine. But I do find it a cruel irony that, while a Parliamentarian can be admonished by the Speaker for accusing another of lying, they are not similarly admonished for doing the actual lying. John Baird earlier this year claimed, in the House of Commons, that allowing Emirates Airlines three more landing slots at Canadian airports would cost “tens of thousands” of Canadian jobs. Remember that? Tens of thousands! Jeez Louise, John. There really aren’t more than 90,000 Canadians employed in the Canadian aviation industry all told, so far as I can figure, so any labourers counted in the plural units of 10,000 implies up to a quarter of the sector. They were all at risk of unemployment? Because of Emirates? Three landing spaces? If our aviation industry is so imperilled, then let’s get talking about that! Decorum, deschmorum, Baird deserved a routing for peddling patently vacuous lies in the House of Commons, but even in the 40th Parliament, for all it’s “roughness,” he didn’t get one. He should have been mocked and hollered at, torn a new one, politically discredited and accused – indeed – of lying. Because that’s what he did, and that ought to be considered the greatest affront to good government. The self-policed Parliamentary politesse that everyone seems interested in is a skin-deep solution that does not cure the rot in politics. It’s never been the roughhousing that turn citizens off politics – we’re hockey fans, remember? No, it’s the lies. Brazen dishonesty, without reprimand or consequence, is the real sin that’s ailing our politics. Civility is nice, and there is nothing to admire in personal attacks or irrelevant insults. But the tone of Parliamentary debate is a secondary concern to the substance of it. The real game misconducts should be reserved for outright lies. Perhaps it’s a hasty enthusiasm for revolution, but France is the first country to drop recognition of the Gaddafi regime. Paris now recognises the rebellion movement, the National Libyan Council, as the legitimate Libyan government, exiled temporarily to Benghazi as it may be. It’s a fascinating development – European MEPs have been calling for the EU, as a foreign policy making body in its own greater right, to do the same thing, and recognise the NLC as the new recognised power. Britain and Germany have jointly called on Europe to demand Gaddafi step down, while falling short of outright recognising the NLC at the moment. Isn’t she? Here we were, thinking that the role of High Representative was defined in vague latitudes in the Lisbon Treaty because EU superelites wanted to expand Brussels’ sphere of influence on the sly, not retreat from it? Hum. Anyway, my desire for Ashton and the EU to take themselves more seriously is another debate for another day. Whatever mandate she thinks she does or doesn’t have, she does raise a legitimate question as to whether recognition of the NLC at this stage in the game is wise. Yes, it sends a powerful political message to Gaddafi, and may have a domino effect across Europe and the world which could enable NATO or the UN Security Council to get tougher, faster, and that’s for the good (although NATO committing military hardware to anything new right now seems unlikely). It also, I suppose, opens the door to France (and others) trading directly with the NLC: delivering aid, and delivering, one assumes, arms (how soon would Britain follow suit? Not sure whether it’s comedy or tragedy to see Gaddafi and the rebellion, each of them firing UK-made missiles across a smoky Mediterranean sky). But, but, but. The NLC was first conceived on 27 February 2011 – less than two weeks ago. Is there enough certainty whether the NLC is in a condition at this moment to deliver good government? Is it composed of the right people? Is it unified by anything coherent beyond opposition? Unless I’m mistaken, they don’t have a “prime minister” or a “secretary of the interior” or an alternate civil service devising national policy in the wings. If they do, it’s very, very early days. Diplomatically, what is it Sarkozy’s recognising? We can applaud his boldness in not just waiting to meekly follow the global consensus after it’s been crafted (cough * Harper *), but this feisty energy might be best applied to helping the UK-German proposal succeed (however unpopular “Anglo-Saxon” solutions may be). Better, perhaps, to support the NLC’s role as a body facilitating leadership transition – rather than to imagine that they are already rightly governing, or should, having not yet been through an electoral process of any kind. Britain believes there are four priorities for the Nato meeting. These were agreed by David Cameron and Barack Obama in a telephone conversation on Tuesday. They are: surveillance of Libya as a possible precursor to a no-fly zone; humanitarian assistance; work on a no-fly zone; and a tightening of the arms embargo on Libya aimed at members of Gaddafi’s regime. It’s the place to start. If it works, we can fly the black, red, and green Libyan independence flag as a meaningful symbol of a new Libya, rather than of one which doesn’t yet exist. Burning out spectacularly in yesterday’s Barnsley byelection, the Liberal Democrats’ worst fears became a shuddering reality. They fell to sixth position from second in May 2010, now garnering just 4.1% of the vote. Both byelections and polls can be overestimated. Unlike in general elections, voters may tend to hypothesise a bit more relaxedly than they would when burdened by the seriousness of voting for government. But byelections and polls in the UK right now are pointing to the very same patterns – not just the implosion of Cleggism, but a spite for it that makes antipathy to Thatcher look measured. In less than one year! Barnsley was a safe, south Yorkshire Labour seat to start with, and their victory yesterday is of zero surprise. But Labour have done more than recoup whatever share of the vote they lost to the LDs in May – they’ve eaten deeply into its local base. It’s more because people used to think the Liberal Democrats were a social democratic party. Something to the left of New Labour. That was the presumption that led people to believe they could have a moderating influence on the Conservatives. Now we see Nick Clegg properly. He’s no social democrat, he is a John Stuart Mill liberal. Just like David Cameron. Which is to say, he’s a Tory. 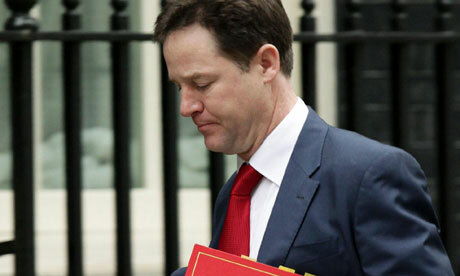 It’s painful to watch Nick Clegg these days. He’s our Prometheus, routinely eaten alive in the House of Commons. He’s putting on weight and losing colour. His eyes are glassy and unfocused. He clearly dreams of himself being anywhere but where he is. Shrugging off polls and byelections as mere half-stories is a small comfort to him, but a comfort that is getting smaller with every fresh example of the party’s collapse. Another issue of concern is not just the Lib Dems ungracious fall in Barnsley, but that Labour’s majority was not increased by quite the same measure. The far-right BNP made gains, and the anti-Europe UKIP surged ahead to place second, albeit a distant second. Again, that’s the Yorkshire anomaly – they can be to the left on the economy, and to the right on social issues, especially immigration. Ironically, that’s exactly the opposite political configuration of the Liberal Democrats in the first place. So, if there’s a tiny modicum of a silver lining for Clegg, it’s that Barnsley was always hopelessly out of reach, and the party nationally should do much better than 4.1% at the next opportunity. Hope springing eternal and all that. What can you protect for two billion bucks? $2 billion. It’s a familiar figure to anyone who was aware, and critical, of the G8/G20 summit security costs in Toronto. Now, an equivalent mound of moola is considered more than adequate, and indeed excessive, regarding the entire security bill for the Sochi Winter Olympics in 2014. The Russian authorities haven’t revealed how much they are spending on Olympic security: the figure is a state secret. Some reports in the Russia media have suggested the total cost will be around $2bn, although Vice Premier Dmitry Kozak says that figure is inflated. So, the Russians consider $2 billion “inflated” when talking about securing, for two full weeks, the world’s largest multisport cavalcade, right on the Abkhazian border, in the heart of the restive Caucasus. Whilst, last year, Ottawa considered $2 billion a reasonable cost for a three-day summit on the shores of Lake Ontario. Which is worse: that Canada is more afraid of its university students than Russia is of its Chechen suicide bombers? Or that Team Harper considers itself a sober steward of our precious tax dollars? I’m awash in a swirling double-helix of nausea. Cue the ticker-tape! Crank up the misplaced national vanity machine! Canada’s future Head of State (from circa 2040 or so? Is it morbid to take bets?) is coming to survey his most expansive royal hunting ground. One hopes one approves of what one sees. And what will the Royal Couple see? It’s a fascinating itinerary. Alberta: Doubtless there will be some Columbia Ice Fields trekking, some Lake Louise paddling, and potentially some calf-wrestling at the Stampede. What’s less certain is whether His Royal Harperness will recommend to His Royal Highness a jaunt to Fort McMurray to see one of our government’s most ethical investments. Northwest Territories: Thank god it won’t be Nunavut, with all its unculled seals flipping about. What will they do there? Ride ATVs, crying out “We make the rules!” perhaps? Visit a diamond mine? Which would be kind of underwhelming after a lifetime of looking at Queen Elizabeth’s hat. No, I know what it is. Some cultures hold that the Northern Lights help you conceive lucky babies. Wink, wink. Quebec: They couldn’t not, really. Perhaps Will’s toothy grin and Kate’s now-ish fashion sense will instill new enthusiasm for British imperialism along the Saguenay. Or perhaps they’ll play it safe and spend the whole time in Lennoxville. Prince Edward Island: God knows. They’re going to Atlantic Canada, and their only stop is PEI. Charlottetown, to see where it all began? Will there be some Anne and Gilbert-style picnics in the meadow? Or just a tailgate party at the Duffys’? Ottawa: You have to, don’t you? I’m sure that, as a proud, exuberant, mostly-sovereign nation, we will fill their hearts with splendour, and that they will return the favour. There’s a slim but not-impossible chance that Will will want to make a strong impression on us – rock the boat a little. Perhaps by declaring himself permanently unavailable for the title of King of Canada in the future, sermonising that “you lot ought to get your own Head of State already.” Tough love and everything. Sadly, the odds of that seem to be about the same as their being greeted at the airport in June by one Prime Minister Ignatieff. Sigh. Long live what we’ve got. MPs have overturned a proposal to make a referendum on the Westminster voting system non-binding unless 40% of the electorate take part in the poll. Peers backed the measure earlier this month but the Commons rejected the proposal by a majority of 70. Cabinet Office minister Mark Harper said there was a “compelling” case for voters to make the final decision. It’s fun reading about someone with the last name “Harper” taking the position that the unelected chamber should bow to the elected. Hee. The referendum, slated for 5 May, now has a much better prospect of being staged at all, and of being a fair account of the democratic will. The battle for Alternative Vote supporters now is going to be to try to disassociate “Brand Electoral Reform” from the toxic “Brand Nick Clegg,” which will not be easy, nor fun. Many erstwhile supporters of the abolishment of first-past-the-post will now potentially use the referendum as an occasion to simply bludgeon the Lib Dems and rob them of their platform mantlepiece, sadly, which is going deep into cutting-off-nose-to-spite-face territory. Call the Lib Dems what names you will, people – this is your chance to enact one of their platform policies (ones which you voted for last year! ), despite Clegg’s apparent Toryboy sycophancy. That battle will be waged over the next few months. For now, at least, we can be glad that the referendum on the UK’s voting system won’t be subject to quicksand regulations that go beyond those which govern the election of MPs themselves. It’s a goose and ganders situation, which the HoC has cottoned onto. No good setting a precedent whereby turnout thresholds threaten to scupper the voices of active electors. So, in conclusion – phew. For now. When you end up applauded by the likes of Marine Le Pen (as well as the National Post! ), perhaps you should take stock of where you stand on the old fascistometer. When David Cameron said he wanted to see the end of “state multiculturalism” the media firestorm it provoked in the UK soon blew itself out – but it is a different story in other parts of the world. The latest figure to wade into the row is Marine Le Pen, the new leader of France’s far right Front National, who has congratulated Mr Cameron for what she claimed was his endorsement of her party’s position.